Can Trump Bring Back American Jobs? Donald Trump promised to be the greatest job-producing president in U.S. history. In his first two years, he's created 4.7 million jobs. That's a 3.1 percent increase over the 152.3 million people working at the end of Obama's term. He pledged to create 25 million jobs in the next 10 years. If he did it in eight years, that would beat the current record-holder, President Bill Clinton. He created 18.6 million jobs during his two terms. President Roosevelt increased jobs by 21.5 percent, the largest percentage increase of all presidents. To beat that record, Trump would have to create 32.7 million jobs. To create those jobs, Trump promised to boost economic growth to 4 percent per year. He pledged to create good, well-paying jobs, not just low-wage service positions. His plan includes an "America-First" trade policy, tax cuts, and rebuilding infrastructure. Here are Trump's job-creation policies for each initiative. Trump's trade policy is based on economic nationalism. He supports tariffs, duties, and other forms of protectionism to give domestic industries a competitive advantage. America lost 34 percent of its manufacturing jobs between 1998 and 2010. These were well-paying, steady jobs. On average, manufacturing jobs pay $79,000 a year. U.S. companies outsourced many of these jobs to save money. But robotics, artificial intelligence, and bio-engineering also destroyed jobs. So ending outsourcing may not bring back all the decent jobs that were lost. Government-sponsored training for these specialties might create more jobs for U.S. workers than Trump's trade war. Training is just one of the three ways to fix IT outsourcing. Trump plans to take action to reduce China's use of subsidies, which undercut U.S. prices. He would prosecute these trade cases against China at the World Trade Organization. If China persists, then he would impose countervailing duties on all imports from China. He would also identify where China has stolen intellectual property from U.S. companies and bring these trade disputes to the WTO. But China could retaliate against U.S. subsidies for oil, agriculture, and ethanol. Trump should also require that any company that wants to sell to America's market must set up factories to hire and train local workers. China requires this already. China's economy is built largely on its competitive exports and huge production output. Trump pulled out of the Trans-Pacific Partnership. He says it would force U.S. workers to compete with lower-paid Vietnamese workers, thus sending more jobs overseas. On the other hand, the TPP was formed to help the United States strengthen its ties with Asian countries that are struggling to compete with China. Without the TPP, these countries will rely more on China and less on the United States. That will make America less competitive. Trump has many initiatives that involve Mexico. First, he would renegotiate the North American Free Trade Agreement to end the maquiladora program. That would bring back some U.S. manufacturing jobs that are now sent across the border. It would also put other companies out of business without the low-cost labor that Mexico provides. If Mexico had refused to revisit NAFTA, then Trump threatened a 35 percent tariff on its imports. Mexico wouldn't risk losing the $294.7 billion in exports to the United States. That's 80 percent of its total export business. If the tariff were imposed, it could create jobs for U.S. producers of these imports. That would include manufactured products, oil, and agriculture. On the other hand, consumers would face goods that were 35 percent more expensive. By law, President Trump could only raise tariffs by 15 percent for 150 days without Congressional approval. But Trump claims the tariffs are needed for national security. What happens if Trump dumps NAFTA? The resultant higher tariffs will increase prices for imports from Mexico on such goods as oil, fruits, and manufactured goods almost overnight. Meanwhile, the volume of U.S. agricultural exports to Mexico will fall drastically as Mexico raises its tariffs in retaliation. Mexico is a top buyer of U.S. beef, grains, and apples. On the other hand, low-cost factories set up by U.S. companies in Mexico could close and return to America. Trump promised to erect a wall on the Mexican border and force Mexico to pay for it. At the same time, he would deport undocumented workers. By reducing the number of low-wage illegal employees, Trump hopes to increase the number of jobs available to Americans. But these are not the well-paying jobs he promised. In many cases, farmers and other businesses cannot find enough legal workers to fill these jobs. Many of them worry they will go bankrupt if Trump closes the border. Trump's tax plan lowers the corporate tax rate from 38 percent to 15 percent. The United States has one of the highest corporate tax rates in the world. It forces companies to move their operations and jobs overseas. But the effective tax rate is already 15 percent. That's because corporations have tax attorneys who take advantage of deductions, lowering their effective rate. Almost half of corporations pay no taxes. They are "S" corporations that pass the tax burden to their shareholders. A more cost-effective method is to cut business payroll taxes. One billion dollars in payroll tax cuts create 13,000 new jobs. Trump's across-the-board tax cuts only create 4,600 new jobs for every $1 billion in cuts. The best plan would also target any stimulus to small businesses. They produce 65 percent of all new jobs. Although tax cuts create jobs, they don’t create very many and are not effective in the long-run. An effective tool for job creation would be an expansionary monetary policy which increases the volume of money circulating in the economy. More money going around means more consumerism, more demand, more business, and therefore more employment. Trump promised to spend $100 billion a year for 10 years to repair America's aging roads, bridges, and airports. As of 2018, Congress has allocated $21 billion. If Trump got his way, it would be more than Obama's Economic Stimulus Plan. It spent $261 billion in four years on shovel-ready projects. Construction is the most efficient use of federal dollars to create jobs. A UMass/Amherst study found that $1 billion dollars create 19,795 jobs. Government spending on public infrastructure is one of the four best ways to create jobs. The other three are the reduction of interest rates, spending on unemployment benefits, and tax cuts on payroll taxes. But this is not the time to add expansionary fiscal policy. The economy is already in the expansion phase of the business cycle. That much spending could overheat it and create inflation. If that happens, the Federal Reserve will raise interest rates to cool things off. The Fed's response would increase the $266 billion interest payment on the national debt. A lower U.S. minimum wage helps companies compete. That's especially true for exporters since the dollar has risen 25 percent since 2014. The dollar's strength makes U.S. workers 25 percent automatically more expensive than before. The government must carefully evaluate the minimum wage pros and cons when deciding to lower, raise, or keep the current wage level. Trump would leave it up to the states to raise the wage in areas with a higher cost of living. He admits that, after campaigning around the country for two years, he doesn't see how anyone can live on $7.25 an hour. In fact, the head of a family of four making that wage would be living below the poverty level. Income inequality is a problem in the United States as one-fourth of the U.S. working population can be said to be living below the federal poverty level. In his first 100 days, Trump declared a moratorium on new federal regulations. He asked federal agencies to identify regulations that cost jobs so they can be repealed. Trump claims that federal regulations cost the economy $2 trillion in 2015. Trump wants to dismantle the Dodd-Frank Wall Street Reform Act. He said the Dodd-Frank regulations hurt smaller community banks while helping big banks get too big to fail. Congress can't repeal the Act without the unlikely support of Democrats. Trump's pick for Treasury Secretary, Steve Mnuchin, wants to keep the Volcker Rule but look at its impact on bank liquidity. He also wants a clearer definition of proprietary trading. Trump's expansionary fiscal policy would create U.S. jobs in the short-run. It would boost growth to 3.5-4 percent. That prosperity could last two to three years. It may be enough to get Trump re-elected to another term. In the long-run, it would cost jobs. The growth Trump is planning is more than the ideal growth rate of 2-3 percent. That kind of a boom leads to a bust. Tax cuts are also an expensive way to create jobs. Every dollar in lost tax revenue only creates 59 cents in economic growth. Companies won't create new jobs unless there is the demand. Right now, corporations are sitting on record levels of cash. Instead of creating jobs, they are buying other companies and expanding overseas. Tax cuts are not one of the four best ways to create jobs. 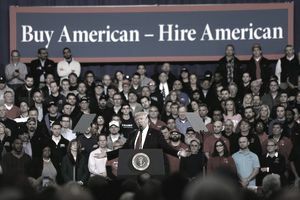 The National Association of Manufacturers agrees with Trump's plan to lower U.S. manufacturing costs, which are 20 percent higher than in other countries. It would also like to see him reduce regulations that cost $180 billion a year. NAM disagrees with Trump's plan to end free trade agreements. Other countries have promised to raise tariffs in return. That reduces American exports to those countries. One reason for slow U.S. growth since the recession is that international trade hasn't rebounded. Tariffs and a trade war would only worsen that. A trade war also raises prices for American consumers. That includes the $481.9 billion in consumer electronics, clothing, and machinery imports America buys from China. It would also damage U.S. corporate profits. That's because many of those imports are manufactured in China for American companies. The current set-up involving U.S. trade with China allows American consumers to purchase goods at very reasonable prices. These goods would otherwise be expensive if these were manufactured in the United States.